STEM Program: STEM (which stands for Science, Technology, Engineering, and Math) is an important, interdisciplinary program that is incorporated into education at all levels, from early childhood to high school. It allows children to use their curiosity and interest in the world to ask questions, solve problems and gather information. 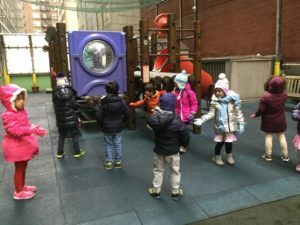 Children do this naturally while playing and exploring, particularly in environments that support play-based learning and encourage children to “take risks” (that is, try new things without fear and/or worrying that they will make a mistake). STEM classes are held every two weeks, beginning in January, in our Green (3s), Pre-K (4s), and Junior K (4s/5s) classes. Green Room children begin the Handwriting Without Tears program by putting together “Mat Man,” a figure that uses lines and curves to create a “man”…the same lines and curves that are used to write letters! Handwriting: The Green Rooms (3s) join the Pre-K (4s) and Junior K (4s/5s) classes in beginning handwriting classes this semester. IPS uses the Handwriting Without Tears program in our classrooms. 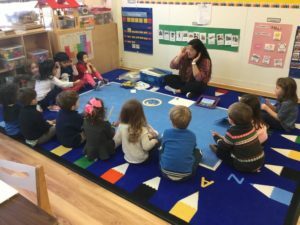 While the Pre-K and Junior K classes have been working on handwriting since September, focusing on a different letter each week, the Green Rooms will begin their learning with practicing how to make big and little lines and big and little curves first, ultimately using those shapes to write the letters of the alphabet. Fathers and Special Friends Read-Aloud: The Green, Pre-K, and Junior K classes take part in this program, which is celebrating its tenth year at IPS. Here, fathers, brothers, uncles, grandfathers, cousins, and other male friends and relatives are invited to visit the IPS classrooms and read a picture book aloud to their Green Room students; in the Pre-K and Junior K classes, these visitors will read a chapter aloud from a book chosen by the teachers. Previous year’s chapter books have included Charlotte’s Web, Jenny and the Cat Club, and My Father’s Dragon, to name a few. After School Programs: Our after school programs began last week, with a variety of sports, theater, science, and other fun classes being offered from 3:00pm-4:00pm every day. Our after school programs will run until the end of May and provide a wonderful enrichment opportunity to our preschool students! We are looking forward to an exciting spring semester at The International Preschools! Interested in joining the IPS community? Learn more about our school by clicking here.